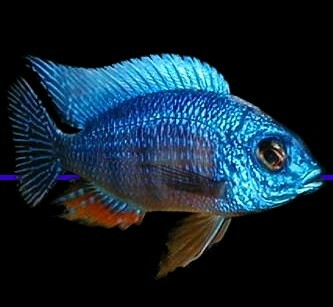 African Cichlids: First and foremost, African cichlids are prized and adored for their beautiful coloration. they are very hardy fish, which makes them easy to maintain. Their care is not so easy, however, that it would bore the advanced, but because they’re hardy they don’t present an impossible challenge for the beginner. The fact that they are freshwater fish simplifies things a whole lot, but what makes their maintenance even easier is that they need hard, alkaline water. Yet another reason for African cichlids’ popularity is due to their unique and remarkable behavior. In general, they are very social, displaying lots of energetic movement anytime someone walks past the tank. They will race in a swarm along the glass, always appearing starved. African cichlids are also very aggressive fish. For the beginner this may be daunting, but if enough about their behavior and needs is understood, this attribute can be turned to the advantage of the aquarist. One of the advantages this aggression has is that African cichlids can be “crowded.” When kept in a crowded environment, aggressive and dominant fish tend to lose their victims in the crowd. Crowding is actually a condition that is found in the wild, as they are often found in densities as high as 10-18 fish per square meter. African Cichlids come from Lakes Malawi, Victoria, and Tanganyika in Africa. South American Cichlids: South American Cichlids are a diverse group of fish often referred to as New World Cichlids. Cichlids are hardy, easy to care for fish that add brilliant color to the freshwater aquarium. South American Cichlids are found from Central America through South America and can be categorized into Dwarf Cichlids, Larger Amazonian Cichlids, and Larger Neotropical Cichlids, all of which have different care levels and tank requirements. These larger species are mostly predatory fish that are territorial in nature and should be maintained in the semi-aggressive or aggressive aquarium. South American Cichlids have very interesting personalities and are extremely intelligent fish with highly evolved parental skills, making them one of the most popular groups of aquarium fish. Goldfish: The goldfish is usually classified as a coldwater fish, and it can live in an unheated aquarium. Build-up of this waste to toxic levels can occur in a relatively short period of time, which is often the cause of a fish's sudden death. It may be the amount of water surface area, not the water volume, that decides how many goldfish may live in a container, because this determines how much oxygen diffuses and dissolves from the air into the water; one square foot of water surface area for every inch of goldfish length. If the water is being further aerated by way of water pump, filter or fountain, more goldfish may be kept in the container. Goldfish may be coldwater fish, but this does not mean they can tolerate rapid changes in temperature. The sudden shift in temperature that comes at night, for example in an office building where a goldfish might be kept in a small office tank, could kill them, especially in winter. Temperatures under about 10 °C (50 °F) are dangerous to goldfish. Conversely, temperatures over 25 °C (77 °F) can be extremely damaging for goldfish (this is the main reason why they shouldn't be kept in tropical tanks). Community Fish: A Community Aquarium is a fish tank that contains a diverse group of fish, rather than just one type. Although there is no question that a tank full of the same species of fish, such as Guppies or Neon Tetras, can be very attractive, it still is far more interesting to have an aquarium that houses several species of tropical fish at once.